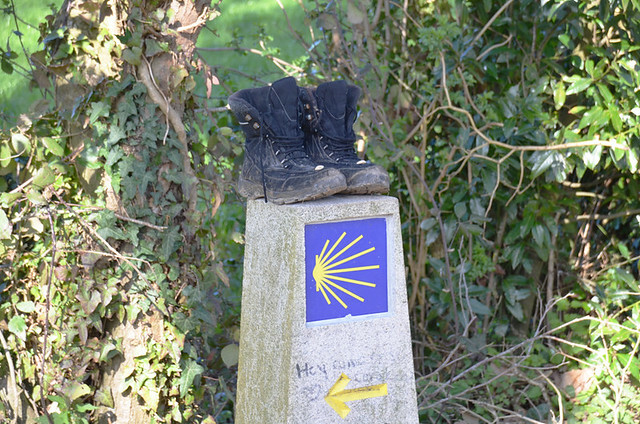 Why are there discarded boots on the Camino de Santiago? There was a tradition of burning boots and clothes at Cape Finesterre at the ‘end of the world’ when the Camino pilgrimage was over. I get the symbolism of that. But why, a couple of days walking from Santiago de Compostela, leave what looks like perfectly good boots atop concrete signposts with bright yellow scallop shells engraved on them? They looked like perfectly good boots as well. Discarded boots on the camino. 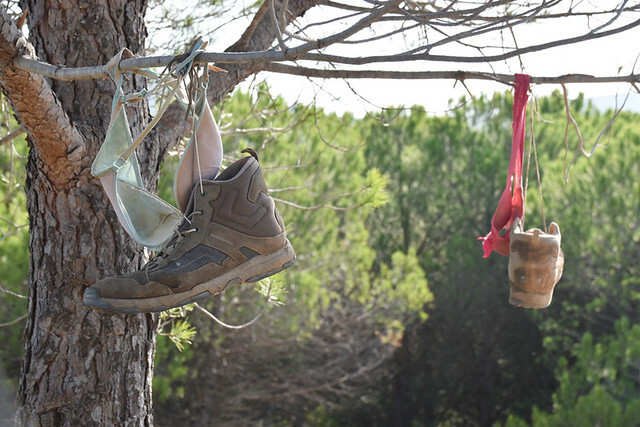 Leaving boots along the Camino de Santiago is clearly not an unusual practice. 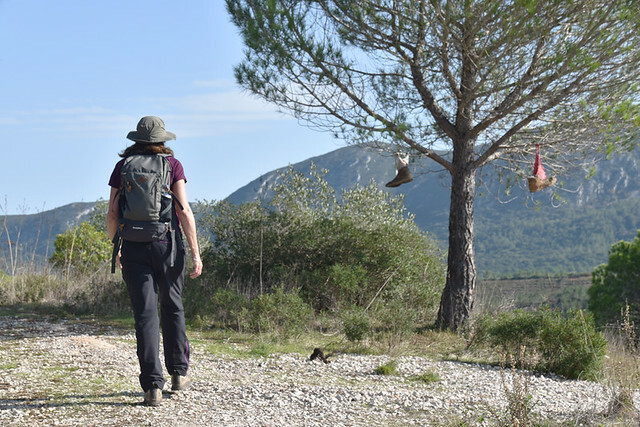 But finding boots hanging from a tree in Arrabida National Park in Portugal reminded me of the Camino tradition. However, the Arrabida boots had a rather bizarre aspect to them; they were accompanied by bras. There were also some women’s knickers strewn around the dry grass beneath the tree. The mind boggled at what might have taken place at the spot. Was it the scene of a crime, or a raucous party? A picture posted on facebook prompted suggestions of a rural drug den/brothel… in the middle of the countryside. Definitely a niche business if either/both were the case. Finding the bra tree in Portugal. The bra and boot tree got me thinking about other odd little scenes we’d happened upon whilst walking. Germany is good for surreal forest scenes, especially in the Black Forest where fairy tales don’t seem quite so fantastical. Paths can weave past carved mythical creatures, inns which claim to cater for woodland dwarves, and gorges where sprites are said to live, and occasionally molest walkers. Mostly things you stumble across are quite obviously the work of human residents. 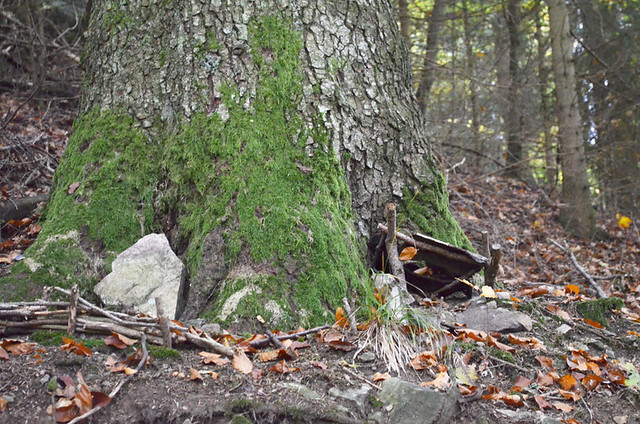 But in one unnervingly dark part of the forest we spotted tiny little doors at the base of some trees. It wasn’t near any attraction, popular walking area, or urbanisation at all. Often, like the elf doors, these route oddities can be unsettling, and we don’t linger long after pondering why they might exist. Little doors in the trees and a tiny fence. Why? In a small clearing in the woods at Las Alpujarras in Andalusia was a smattering of dirty, old bits of children’s toys. It didn’t look as though it was a secret den or anything like that, the toys didn’t look as though they’d been played with… just collected. Why and by whom? That was the question. There was something rather sad about the little scene; as if a ghost child had been stockpiling the unwanted parts of local children’s toy collections. 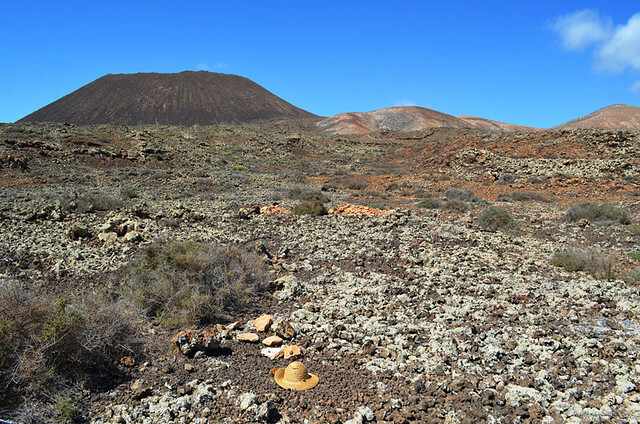 More disturbing was a hat pinned to dry volcanic terrain on a path in the centre of Fuerteventura. Anyone who knows that Canary Island might know it’s a haven for sun and sand seekers rather than hikers, so few folk explore the paths of its hinterland. If anyone had dumped a body in that spot it might be years before anyone stumbled across it. As well as the hat there was a jumper with worrying red stains on it. It was like the opening credits to a Breaking Bad episode, which we were watching at the time and which fuelled speculation about what might lie under the hat. It might sound ridiculous nonsense to you, but it took us a while to work up the courage to remove the pin and lift the hat. Had there been a head looking up at us I wouldn’t have been surprised. There wasn’t. 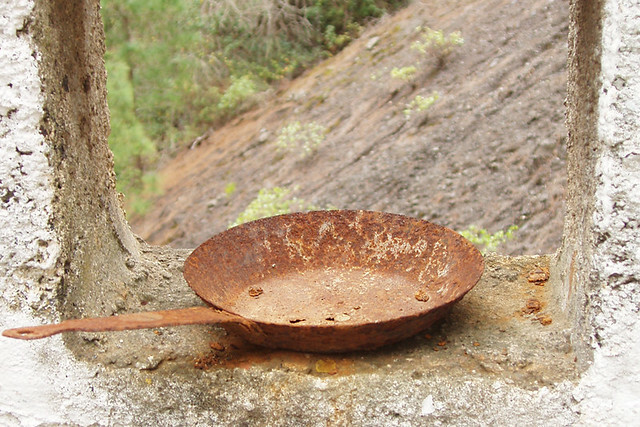 A discarded frying pan in an abandoned mining camp on Tenerife. 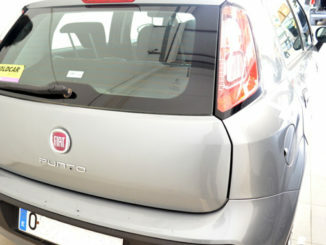 A spookier find took place on Tenerife. We were following a route which was supposed to lead to a magical cave. Although there was an annual pilgrimage to the cave from the nearest town, the way was unmarked and overgrown. We must have taken a wrong turning as we found ourselves in a narrow ravine which came to a dead end at a small mining encampment where there was a building, rails leading to nowhere and the entrance to a mine. What made it spooky was there was a Mary Celeste element to the scene. Inside the building a table was laid out with rusty plates. 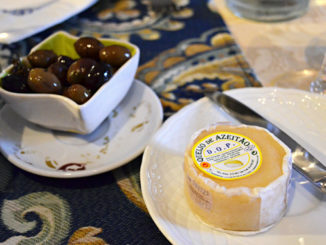 There was even a half empty wine bottle on it. Additionally, a couple of threadbare jackets hung on hooks inside the open door. It looked as though it had been abandoned in a hurry. Needless to say we didn’t hang around. I’m not sure I could find my way back to the place. I’m not sure I’d want to. The mind boggles as to what went on here. I’d rather ponder the mysteries of a tree decorated with bras any day of the week.